Seaview Resort and Spa is one of the island’s largest mid range hotels. 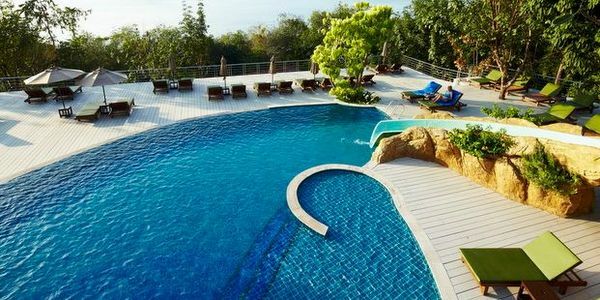 Located at the southern end of Kai Bae, Seaview Resort and Spa has 157 rooms and suites in landscaped gardens by the sea, on the hillside slopes and on the cliff face, together with swimming pools, terrace, spa and restaurants and even a a funicular railway. Accommodation comes in many different styles. The older cottages are spread about the gardens, whilst the superior rooms and deluxe rooms are over the various floors of the main hotel building, all ocean fronting. Grand deluxe rooms are situated in the cliffside building, connected to the rest of the resort by funicular railway. The suites are also in the main building or by the beach, with the family and junior type up by the hillside pool. Seview Resort has two very pleasant pools, not huge but more more than adequate, one beachside and one cliff-top complete with a slide for the kids. There are also plenty of loungers, with a nice resort policy of no-towel reservation. Seaview Resort is located on the the best section of Kai Bae Beach, with the main pool just steps away fom the sand. Though the sea retreats considerably at low tide, you can still swim most days and this whole stretch of beach is wonderfully peaceful and private. It also has one of Koh Chang’s most iconic views with the dramatic scattering of unihabited islands offshore. You can very easily kayak out to them and when the tide is low, with suitable footwear, you can walk across the rocks to the nearest and largest, Koh Man Nai. The standard amenities in Seview Resort rooms include individually controlled air-conditioning, TVs, cable tv access, safes, tea and coffee making facilties, refridgerators, bathroom accessories, balconies or terraces. The more deluxe rooms have bathtubs or whirlpools and additional seating areas. A full buffet breakfast is served at the hillside Lighthouse Restaurant, where the views out to sea are stunning. It reverts to a menu for the rest of the day with a seafood bbq option in the evenings. The Sunset Beach Restaurant offers an à la carte menu with all the usual Thai favourites and plenty of western choices specialising in Italian. There is a sometimes open pool bar and a coffee shop. The food and drink gets mixed reviews only. As an alternative, you can take a 10 minute walk down the road into Kai Bae Village, with its wide variety of restaurants and bars. Look out for Ziva Italian, 02, Wine Gallery, Mojitos, Barrio Bonitos and Took Ka Ta Kai Moon among many others. The hotel has its own Spa, open daily from 09.00am to 20.00, together with a fitness center and snooker room. The staff and service at Seaview are, on the whole, keen to please and very helpful. Despite its size, Seaview Resort feels very secluded, tucked away from the world at this far end of the beach. Its location, however, does have its downsides too, as the resort is isolated from Kai Bae itself. A shuttle service operates into the village at different times of the day, but this is difficult to rely on. Both the walk down and back up the steep hill is an unpleasant hike, only avoided if you have a rental motorbike or if you fork out for an annoying short taxi ride. It’s also difficult to cut down the beach as the seawall that makes the resort so private becomes a considerable barrier to overcome if the tide is up. Design wise, the resort feels a bit of a curate’s egg. The older cottages are in need of some attention, while the main building down by the sea unsympathetically clashes with its forest surroundings. The rooms though have some great features and the use of glass doors gives them light and space. Its cliffside building is spectacular and the two pools and two restaurants occupy terrific positions overlooking the ocean. Indeed, the sunsets here are some of the most spectacular on the whole island. Seaview Resort is one of Koh Chang’s longest established hotels. It has maintained a solid reputation over many years and continues to pull in the crowds. It makes for a very reliable choice in the upper mid-range category but be prepared to pay some prices that reflect this. 0-2 stay for free in crib/cot. Children 2-12 charged at 225bt if using existing bedding. Over 12s at 1,500bt in extra beds Supplements will be charged as extra.